DENOUNCING the Government's Brexit white paper as a fudge, former education secretary Justine Greening calls for a second referendum. Yup, that's just what we need. A second vote would have the immediate, decisive, positive and conclusive effect of turning a compromisy sort of fudge into a fudgy sort of compromise. TORY minister Andrew Griffiths sent 2,000 sexual text messages to a barmaid and her friend and has resigned for the only unforgivable sin in Parliament - getting found out. We can only wonder how someone so stupid was selected as a candidate in the first place. It's not that politics brings out the worst in people. Sometimes politics simply brings out the worst people. SHOCK, horror! 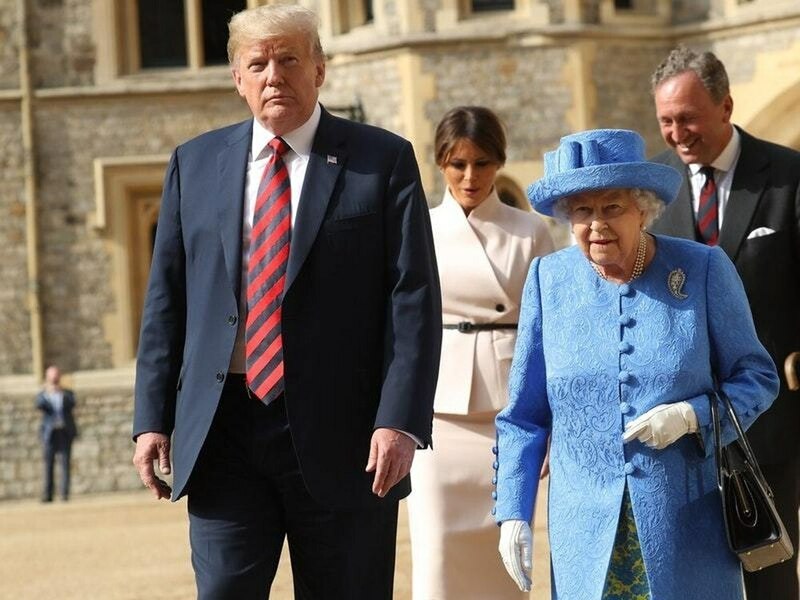 In a massive, world-shaking, epoch-ending and possibly catastrophic breach of protocol, Donald Trump has revealed that, in a private conversation, the Queen described Brexit as "a very complex problem." In the same conversation, Her Majesty apparently expressed the view that it was rather warm, that the Pope, in all probability, is a Catholic and that bears tend to defecate in forested areas. Hold the front page. MEANWHILE, amid the battlefield that is Brexit, the campaign for an independent Scotland splutters on. There is talk of a second referendum on the issue this autumn. This IndyRef2 campaign is led by politicians who think they can convince their people that while it is proving fiendishly difficult for the UK to leave the EU after 41 years, it'll be dead easy for Scotland to leave the UK after 311 years. YOU may recall I wrote some time ago about our local council erecting, at great expense, an anti-caravan gate at the local park so immense and so strong that it would probably stop a Challenger tank. A couple of days ago ten caravans quietly set up camp in the park. The travellers had totally ignored the shiny, formidable front gate and slipped in through the rickety old back gate. Who'd have thought it? "AN Aladdin's Cave" was how one expert described finding the bottle containing novichok in Salisbury. Let us hope so. After all the speculation about the nerve-agent incidents, this is the first piece of solid evidence that can be labelled "Exhibit A" and presented to a court. Hopefully, the magic of DNA and electron microscopes can find something significant. And let us also hope, as Whitehall has already pinned the blame on the Russian state, that it turns out to be from Russia, not closer to home. The ultimate nightmare is a British bottle. I AM a tad surprised that the authorities, at the time of writing, have not released photographs of this mysterious container. Bottle-collecting is a worldwide hobby attracting all sorts, from millionaires snapping up priceless Roman phials to ordinary enthusiasts amassing old milk bottles for a few quid a time. I would not mind betting that some glassware expert, somewhere, could identify that bottle in a matter of moments. When the scientists can do no more, bring on the geeks.